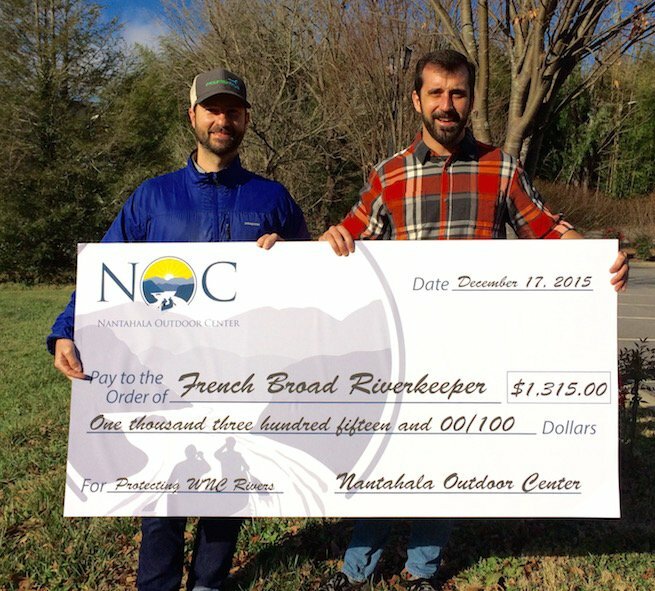 NOC marketing director Charles Conner presented French Broad Riverkeeper Hartwell Carson with a check for $1,315 on behalf of NOC guests. The donation will support MountainTrue’s efforts to protect Western North Carolina’s rivers, especially those like the French Broad and Nantahala that serve as important recreational resources. The donation was raised during the 2015 season at NOC’s Big Wesser BBQ + Brew restaurant on the banks of the Nantahala River. Restaurant guests made donations and purchased raffle tickets, making them eligible to win a custom-wrapped tandem canoe donated by Mad River Canoe. The raffle was part of Sweetwater Brewing Company’s Save Our Water campaign supporting Waterkeeper Alliance efforts throughout the Southeast. Sweetwater Brewing Company provided a custom wrap for the canoe and supported fundraising with events and promotions. “This donation demonstrates NOC guests’ appreciation for the natural resources here in Western North Carolina. Our visitors come to enjoy the area’s phenomenal mountains and rivers and many are excited to give back and help us protect these resources.” said Conner. Hartwell Carson, MountainTrue's French Broad Riverkeeper added: "The French Broad Riverkeeper relies on great partners like NOC to further our work, and make sure we finally live up to the clean water act to have all our waterways meet the goals of the clean water act to be fishable and swimmable." This fundraising effort is one of many programs run by the three partner companies to support recreation and conservation. But this new fundraiser presents area visitors with a well-timed opportunity to give back—immediately after a paddling trip on the Nantahala when they’ve had one of their most immersive outdoor experiences. The partner companies plan to expand on these efforts in the future and are currently planning 2016 fundraising efforts.